My Series Sunday pick is South Seas Shenanigans, the sixth book in the Logan Dickerson series by Abby L. Vandiver. Archeologist Logan Dickerson, VooDoo Herbalist Sleuth Miss Vivee and her new husband are back. The trio never fail to run into a dead body. It is amazing how two 90-year-olds are so sharp to identify rarely heard causes of death. Being in Fiji for a dig and honeymoon is no exception. Murder follows them everywhere! Abby, I love keeping up with you and for introducing readers to unique characters of color. We need more fictional positive women. However, it is difficult to finish a book when discovering 40+ errors in less than 125 pages that could have been avoided with skilled editing. My professional copyediting offer still stands if interested. The best part of South Seas Shenanigans is the title. Catchy and oh-so-perfect with the storyline and colorful book cover. Pristine turquoise water. Inviting island hut. 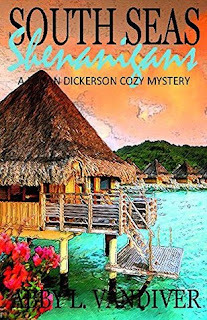 Bookhearts, if you are into cozy mysteries and can overlook typos or grammatical errors, then read this latest installment of the Logan Dickerson series. Unfortunately, much as I like the main characters, I cannot continue to spend money or time on poorly edited published work. It seems to get worse by the book—not better. So bookhearts, reading this series was fun while it lasted.